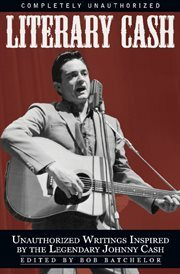 The item Literary Cash : Unauthorized Writings Inspired by the Legendary Johnny Cash, (ebook) represents a specific, individual, material embodiment of a distinct intellectual or artistic creation found in Charlotte Mecklenburg Library. A collection of stories, essays, and more inspired by the country music legend and his songs. The legendary lyrics of Johnny Cash are the inspiration for this collection of creative works that put a new spin on the musical legend. For nearly five decades, Cash captivated audiences with his unique voice and candid portrayal of the gritty life of a working man, and his songs continue to strike a chord with listeners today. But it is the stories behind the music that remain with audiences and provide the inspiration for the work in this thoughtful compilation of fiction and nonfiction from contributors. What do Johnny Cash and C. S. Lewis have in common? Don Cusic offers up an interesting answer. A boy named Sue meets a girl named Fred in an endearing story by Lauren Baratz-Logsted and Greg Logsted. Robert G. Weiner explores the Man in Black as seen on TV.A teenage girl learns about fidelity, incarceration, and the profound impact of music in a powerful story by Amanda Nowlin-O'Banion. Tiffany Lee Brown's gripping story of a Reno shooting ends with a twist. Plus, works by Gretchen Moran Laskas, Russell Rowland, Leigh H. Edwards, and more!